It's time to send another update on our 2018 Revenue Challenge progress and ways to help meet the goal of doubling the revenue of the Rec in 2018 as compared to 2016. The goal is a little over $110,000 (2016’s revenue of $55,000 x 2). This pie chart shows the progress through September. 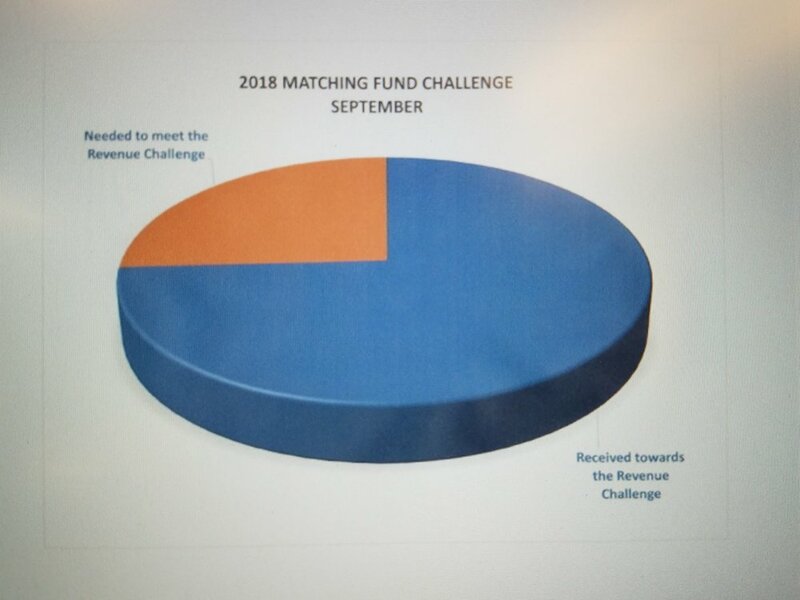 We have almost $30,000 in revenues to add in these last three months of the year to meet the challenge and receive $55,000 in unrestricted matching funds. Along with providing critically needed finances for the Rec Center, a priority list of building maintenance items has been identified that, if successful, this challenge grant will help address. How can you help? Become a member if you aren’t already and consider becoming a Challenge Member in any amount over the cost of a regular membership. Purchase a membership as a gift. Participate in the Rec’s next 30-for-30 exercise challenge beginning November 15. Sign up for a class. Honor your friends and family or remember a loved one with a gift of light on a tree at the Rec (and for this challenge year only, a half- day pass at the Rec will be sent to those you honor) through a Rec Center Season of Lights holiday greeting for a minimum $5 fee (with a suggested $10 fee for this challenge year) per recipient. Because for this challenge, it is only Rec Center revenues that count, we encourage you to focus your generosity towards the Rec Center in the ways shown above as you are able through December 31,2018. It will be good for your health and the health of the Rec!